This post is part of a virtual book tour organized by Goddess Fish Promotions. Alexander Fernandez will be awarding a $30 Amazon/BN GC to a randomly drawn winner via rafflecopter during the tour. Click on the tour banner to see the other stops on the tour. Hi Judy, I really appreciate you having me. 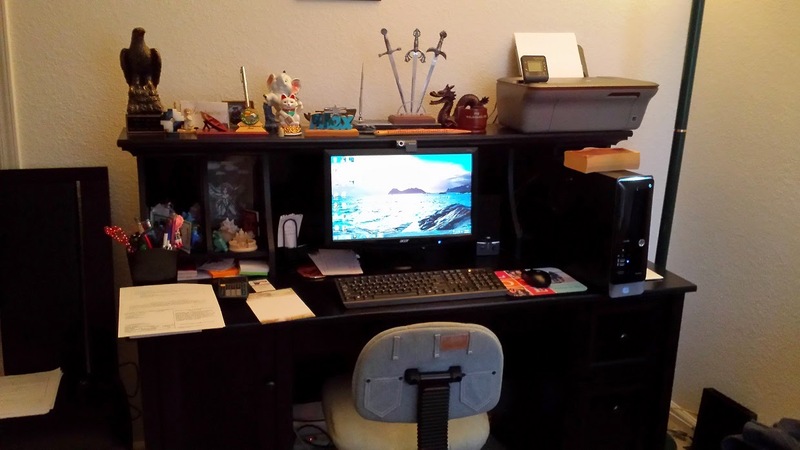 This is a fun topic and I’d love to share some photos of my inside and outside writing space. As for the inside, this entire room becomes my work area because I like to act out scenes, so I don’t just sit at the black desk. Do you like the blue jeans computer chair? My wife hates it, but I think it’s cool because of the belt loops and pockets. 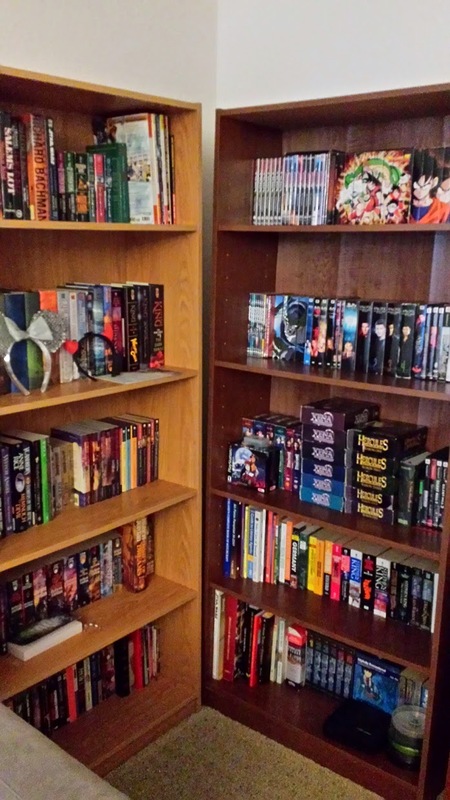 The shelves in the corner are stuffed with books, old PS2 games, some anime, and old TV shows. My favorite is Robotech down at the very bottom. 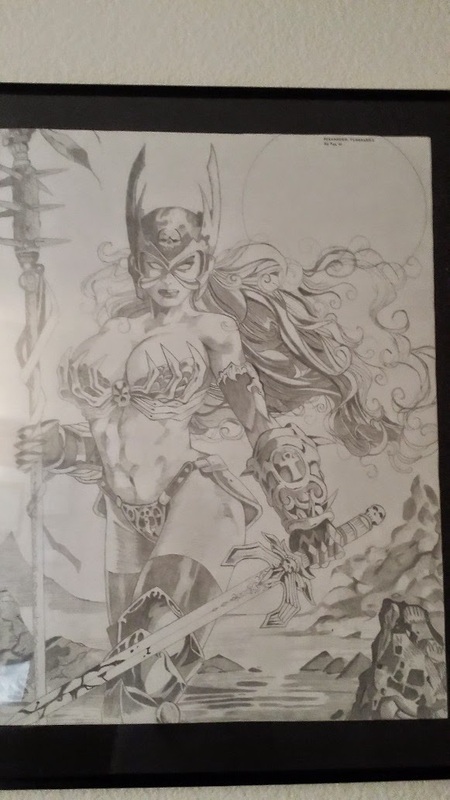 I included a drawing I did of Lady Death back in 2001. The picture is from an old comic page, but I wanted to make a sketch on a poster-sized paper so the frame is actually much larger than it looks. You can see my neglected piano in the corner like a chastised child. If you look closely, you’ll notice that there isn’t even a power cord plugged in anywhere. That’s how little (or no) time I have to ever sit down and practice. 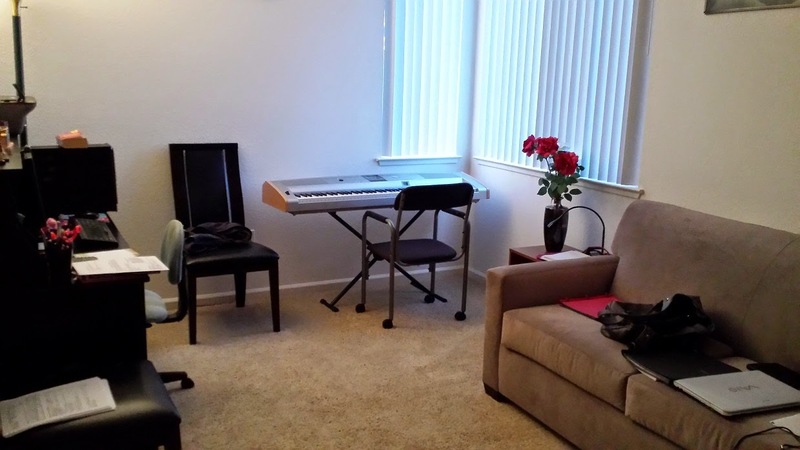 I love piano, but I barely have time for writing so my spare time goes to that. As you may have guessed, the overall theme of the room is creative expression. Music, drawing, and writing. I was always terrible at sports and other activities, so crafting art in a quiet environment has always been more my style. The mood of the room is great when it comes time to write. It helps me relax and get the imagination going. I have my drawings, books, games, and even my jean chair to help find inspiration. It’s a fun little world that supports my writing! 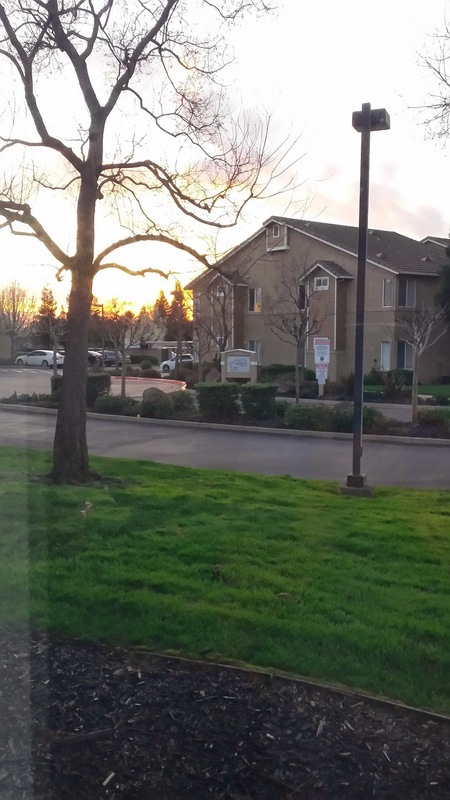 The two windows in the corner of the room provide a decent view of the residential community across the street from my apartment complex. 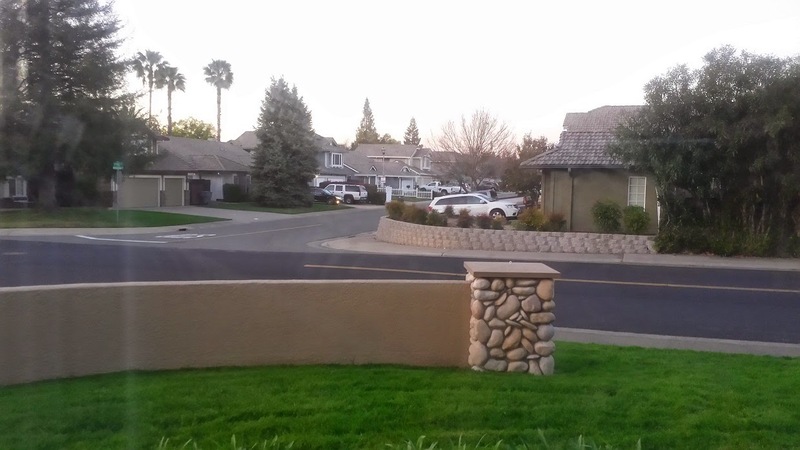 When we first moved here I worried about the noise from the street, but there’s not a lot of traffic and it’s actually pretty quiet. One of the streets about a minute walk from my door is well-known for its amazing Christmas decorations every year. People come by the hundreds to walk and drive along the street to see the lights, animated characters, and music. I’m no photographer, but in the other picture I just happened to catch the sun going down behind one of the apartment buildings next to mine. I thought the view looked kind of cool in the background. Quietness is something I require when writing, and the neighborhood has helped me in that aspect. There’s no freeway or honking cars outside in traffic to shatter my writing mood. So there you have my inside and outside view of where my stories take form. I apologize for the clutter on the couch! The holy artifact bonded around Marisylia Malludar's neck gives her incredible physical and magical powers—at a price. The bloody piece of vein is consuming Marisylia's body inch by inch, her skeletal hands and feet only the beginning of a slow death. A cruel sorceress and her assassins are on the hunt for Marisylia to steal the artifact. 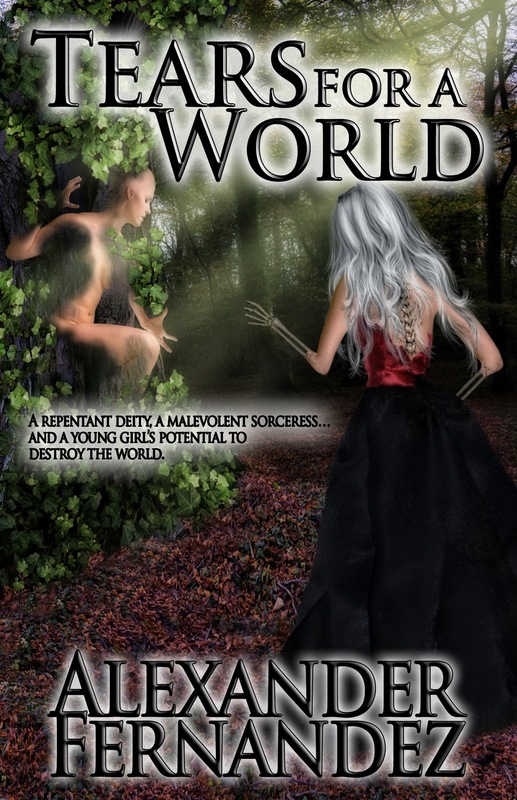 Religious fanatics, volatile and unstable in their blind faith, also seek her to exploit the vein’s most dangerous purpose—liberating the erratic Creator of the World, Lysielle, from her 1,000 year incarceration. With the vein the key to Lysielle’s freedom, Marisylia must use her abilities to survive long enough to find Lysielle first. Then her most grim challenge awaits—deciding if the Creator has truly repented for attempting to destroy all life. To achieve global peace, Marisylia must discover faith in the unpredictable Lysielle or rely on her own instincts to set the world’s fate. Marisylia blinked and rubbed milk out of her eyes, but the mob wasn’t finished. A stiff hand shoved her from behind and she stumbled against the table. Unfinished slices of pie and rolls of bread pelted her. With nowhere to hide, she dove into the horde and tried to shove her way out. Most of the people only yelled insults as they let her pass. Others bumped her roughly with their shoulders, tried to trip her, or pushed her around so she bounced back and forth between pairs of hands. One woman caught Marisylia and carefully steadied her. She peered into the woman’s eyes, one friendly person amid the riled swarm. The lady smiled softly, then suddenly spit into Marisylia’s face. When the saliva splattered her cheek, Marisylia stopped caring why the citizens acted like this. Whether due to fear of the religious power, worry that it would infest Three Fingers, or simply senseless anger, none of it mattered anymore since the time to quit had arrived. All of her determination to succeed had been ripped to shreds by the crowd. Each hand that shoved, every object that struck, drained her enthusiasm. Her devotion to the religion had drowned in the woman’s spit. It was all too much. Marisylia didn’t have Milick’s iron skin or Shri Lilyn’s boldness. She had nothing, only the desire to run away and forget everything. Alexander Fernandez was born in Santa Monica, CA and grew up in Rancho Cucamonga. 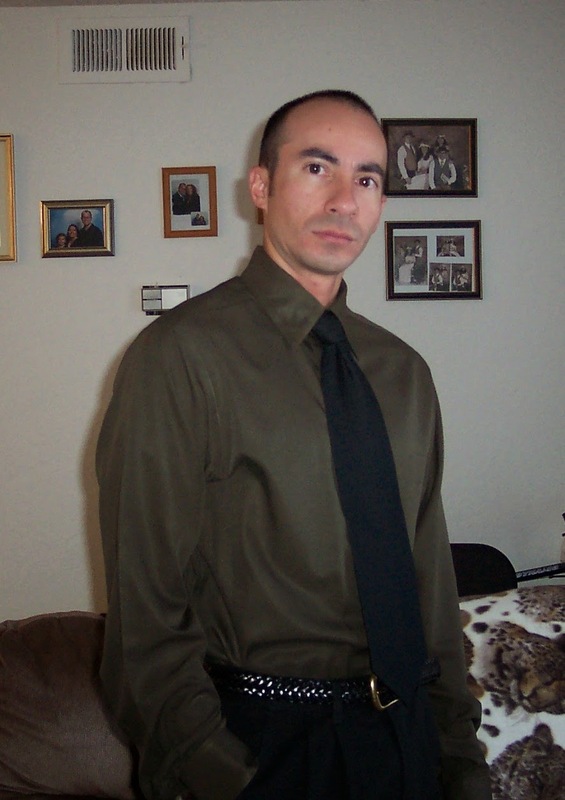 Currently serving over 20 years in the United States Air Force, he lives with his wife Helem in Rocklin, CA. Alex has been writing fantasy stories since early childhood for both school and for pleasure. He hopes to make a lasting emotional impact in his readers. He thrives in the exhilaration of creating memorable characters and adventures that become a part of the reader’s life. Thanks Fiza. I wasn't sure how the shots with my phone would turn out, but looks like they're ok! I really like the cover to the novel.